What's old is forever new—our spaces succeed in merging historic elegance with modern ease. The magic is in the details, and each of our venues is teeming with them: frescoed ceilings, gilded moldings, crystal chandeliers and manicured gardens that perfume the lawns. 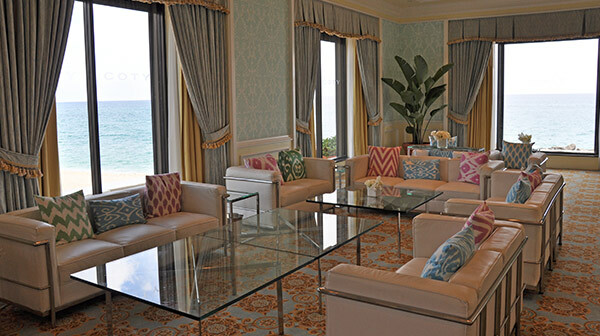 See the incomparable spaces that make our resort the paragon of Palm Beach—120 years and counting. For specific dimensions on any of the venues below, download our complete venue list. And for a visual tour of the resort’s ballrooms and outdoor spaces, explore our Weddings & Celebrations Event Showcase. Share some basics about your event, then one of our associates will personally contact you to discuss availability, pricing and details. Through its 15-foot windows, The Circle boasts a glimpse of spectacular ocean views. The soaring 30-foot domed ceiling features eight oval fresco-painted murals depicting Renaissance landscapes. And at its center, a Venetian crystal chandelier hangs from a stylized gold-leaf sunburst. 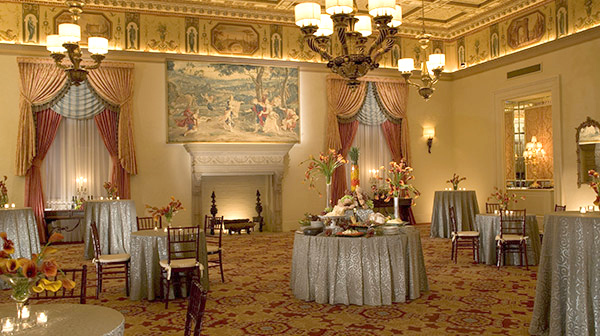 This beautiful room is a perfect location for luncheons, cocktail receptions or extravagant dinners. With floor-to-ceiling windows directly overlooking the ocean, this 9,600-square-foot ballroom features a 25-foot-high ceiling that glows with six chandeliers, custom woodwork and fabrics in golden hues. This spectacular space can host a variety of events including themed parties, receptions and conferences. Photo by: Mel & C0. 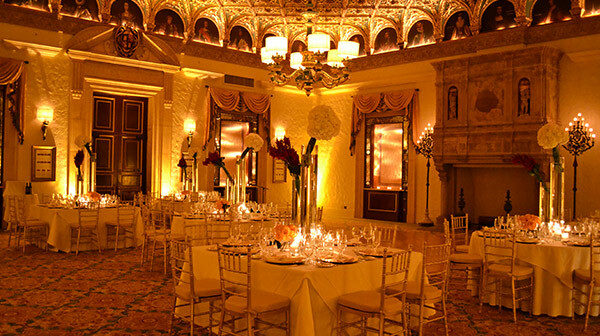 Modeled after the loggias of Italian villas, our magnificent Mediterranean Ballroom features elaborate fresco-painted ceilings portraying the sky, large Venetian-style chandeliers, and a series of 15-foot arched windows overlooking the Mediterranean Courtyard. Measuring over 6,100 square feet, this historic room, is a true piece of history, ideal for meetings, cocktail parties, dinners and more. 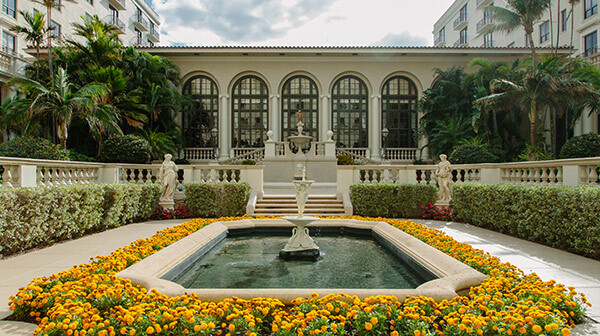 Framed by classic balustrades and accented with tropical flora, the Mediterranean Courtyard can be accessed from the Main Lobby, Mediterranean Ballroom and the North and South Loggias. Reflecting the resort’s Renaissance sensibility, it’s a romantic space that’s ideal for alfresco cocktail receptions, meeting breaks and more. 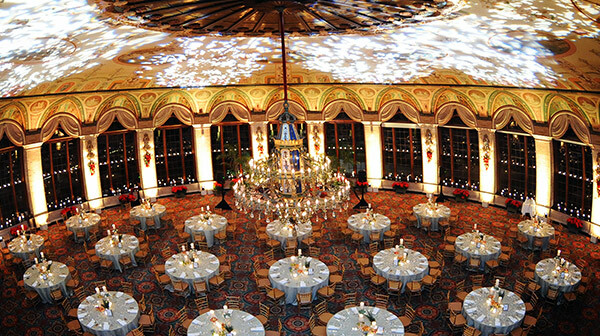 Our largest venue of all, the 15,000-square-foot Ponce de Leon Ballroom stuns with its size, décor and versatility. Its flexible footprint can be divided into six sections, perfect for more intimate events. This spacious ballroom is accented with nine crystal chandeliers, custom luxury fabrics and an 8,000-square-foot foyer boasting a tropical garden view. 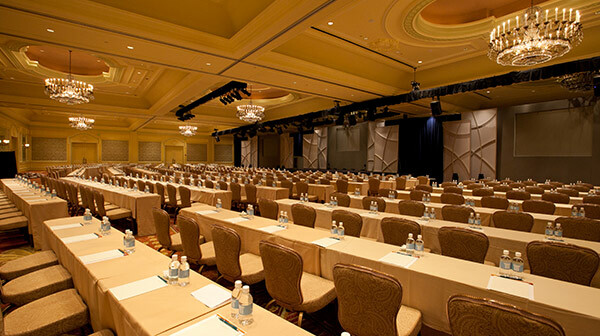 Consider this space for a host of events, from general sessions and exhibits to breakouts and dining options. Aptly named for its gorgeous gold ceiling, painted in a graphic diagonal pattern and adorned with 260 hand-carved cherubs, this room is a replica of a space in Venice's Galleria Academia, originally used by the resort as a social gathering place for guests. Surrounding the ceiling are detailed niches, containing 44 hand-painted portraits of Renaissance rulers and explorers of the New World. Sure to stun, this room is perfectly suited for meetings, hospitalities and dining options. Originally used as the lounge for the north side of the hotel, this special space feels both regal and relaxed. Enter and admire its focal point: a beautiful, Venetian-style stone fireplace, seated beneath richly decorated ceilings. This intimate room is perfectly suited for meetings, hospitalities and dining options. These versatile rooms offer breathtaking oceanfront views set in an intimate atmosphere. 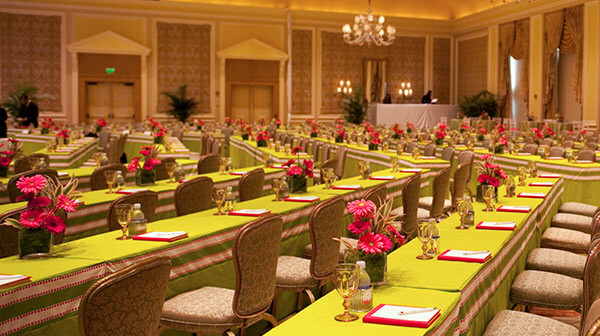 The Gulfstream rooms are excellent options for board meetings, breakouts, offices and dining options. 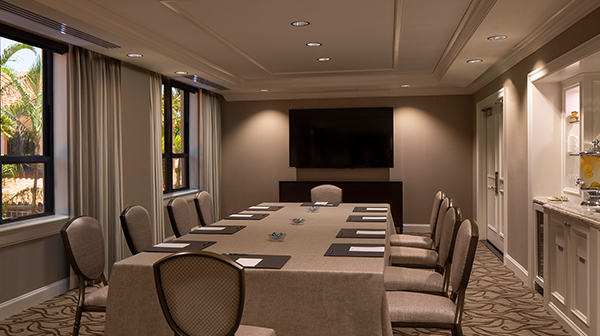 Located just above the Ponce de Leon Ballroom, the South Mezzanine offers 17 intimate meeting rooms, loved for their abundance of natural light. These spaces are ideal for board meetings, breakouts and offices. 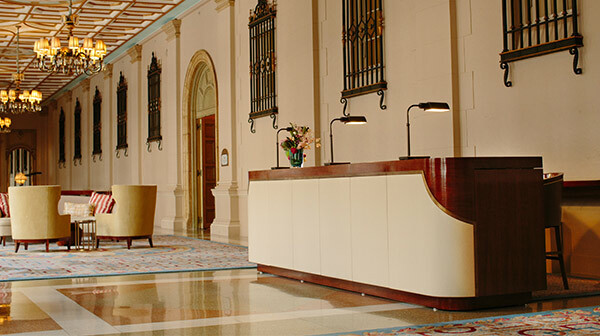 Footsteps from the main lobby and overlooking the Mediterranean Courtyard, our South Loggia is an exquisite setting for conference registration and hospitality services. Two custom-designed desks are inspiring spots for welcoming guests and distributing conference materials, while the plush seating areas that dot the space are perfect for quick huddles between meetings. 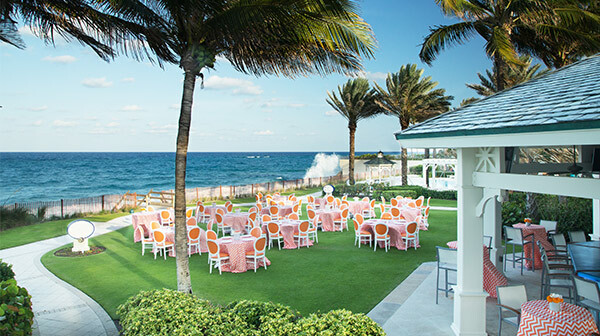 Framed by swaying palm trees and lush landscaping, the Ocean Lawn directly overlooks the Atlantic, rendering it ideal for alfresco cocktails or an outdoor dinner. 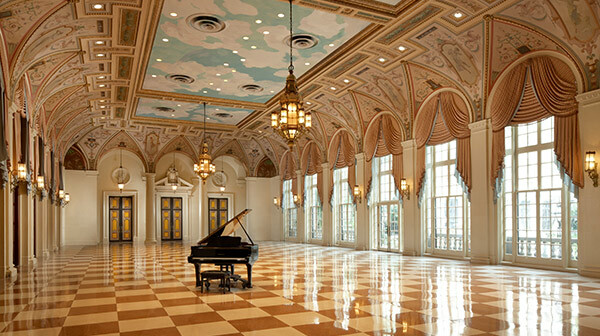 Its location adjacent to the elegant, highly versatile Ponce de Leon Ballroom, gives you endless options for an indoor-outdoor fête. 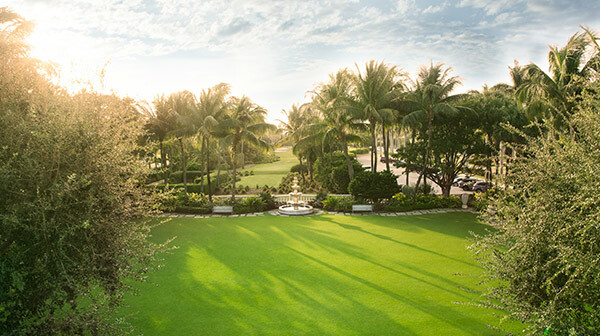 Our most requested outdoor space, this spectacular lawn is ideal for group activities, cocktail receptions, themed parties and other options. The resort’s Front Lawn offers a garden-like atmosphere, thanks to the lush tropical foliage that frames it. 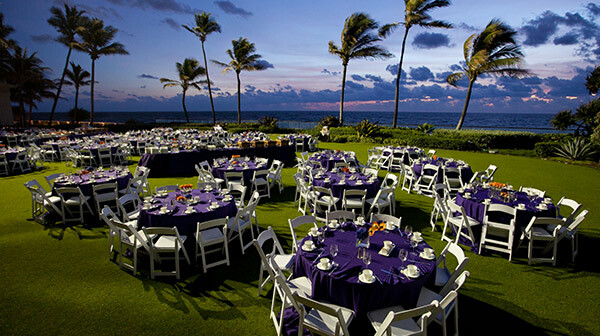 Adjacent to the tranquil Palm Courtyard and The Shops at The Breakers, it’s a picturesque location for group activities, cocktail receptions and dining options. Located just steps from the beach, The Surf Break and its adjoining lawn offer ocean breezes in a laidback setting. 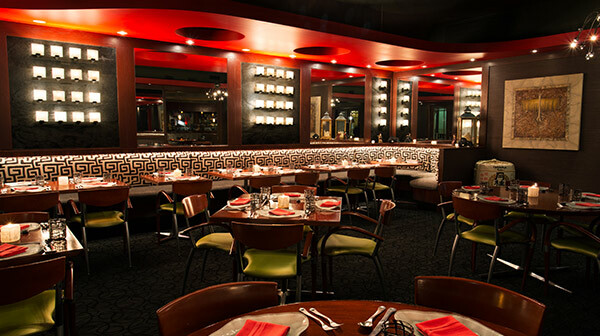 This versatile space is ideal for cocktail receptions, dining options and more. Offering casual sophistication in an ocean- and poolside setting, The Beach Club Restaurant perfectly mixes contemporary elegance with tropical ease. It’s perfect for cocktail receptions, themed parties, hospitalities and celebratory dinners. 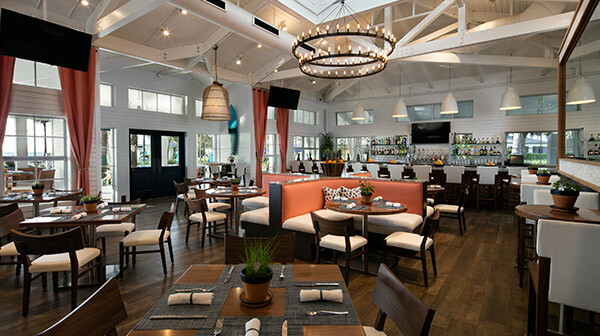 Reminiscent of a seaside cottage, this beach house restaurant offers view of the pools and beachfront. 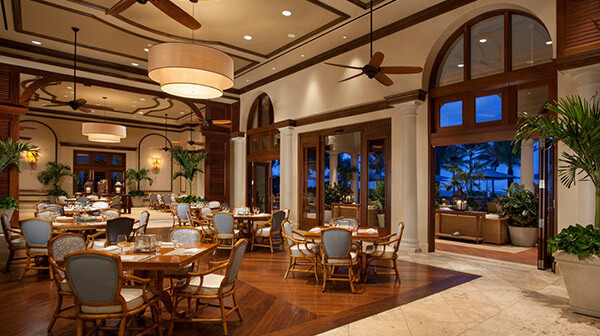 With its covered porch and breezy island vibe, Ocean House has an indoor-outdoor setup that lends well to cocktail receptions and dinners. In addition to our venues across the resort, several of our restaurants feature elegant private or semi-private dining spaces, both indoors and out. Consider a chic supper in the east corner of HMF, an intimate dinner at Flagler Steakhouse, or an alfresco reception in the garden at Echo. To learn more about our options and reserve a space, contact our team at [NAVIS: (877) 724-3188].